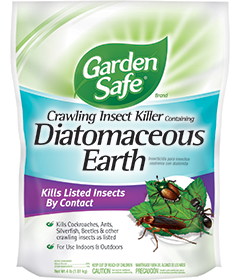 Apply Garden Safe Brand Crawling Insect Killer Containing Diatomaceous Earth with a hand duster, power duster or squeeze bottle for application to areas where crawling insects are found. Apply to cracks and crevices and other areas as directed. Use adequate ventilation and avoid breathing dust. Wear a suitable dust mask when using this product during prolonged exposure. Cockroaches, ants, earwigs, millipedes, centipedes, crickets and silverfish: Lightly coat a thin layer of Garden Safe Brand Crawling Insect Killer Containing Diatomaceous Earth in areas where these pests are found and may hide, such as cracks and crevices; behind and beneath refrigerators, cabinets, stoves and garbage cans; and in and around sewer pipes and drains, window frames and in attics and basements. Dust insects directly if possible. Repeat application when dust is no longer present and insects are observed. Fleas: Thoroughly treat floor and bedding in and around pet sleeping quarters. Treat surrounding cracks and crevices, baseboards, carpeting and wherever fleas are suspected. Bed bugs: Disassemble the bed frame and remove bedding. Do not apply product to bedding. Apply this product to the bed frame, mattress and box spring. Application to mattresses and box springs is intended for treatment of seams, edges and tufts only. Do not treat the entire surface of the mattress or box spring. After four hours, vacuum the dust from the mattress. Also apply the product to cracks and crevices in the sleeping area such as baseboards, behind pictures/wall hangings, along and underneath carpet edges and other articles/furniture in the bedroom or sleeping area. Do not apply to stuffed animals or toys. Cockroaches, earwigs, millipedes, centipedes, slugs, grasshoppers, ants, crickets and other crawling insects: Lightly coat areas where these insects are found or may hide, such as patios, planting beds, outdoor sills, window and door frames, and outside of entranceways. Dust around foundations, along ant trails and around sewer pipes and rains. Disposal: If empty: Nonrefillable container. Do not reuse or refill this container. Place in trash or offer for recycling if available. If partly filled: Call your local solid waste agency for disposal instructions. Never place unused product down any indoor or outdoor drain. CAUTION. Causes moderate eye irritation. Avoid contact with eyes or clothing. Wash thoroughly with soap and water after handling and before eating, drinking, chewing gum, using tobacco or using the toilet. If in Eyes: Hold eye open and rinse slowly and gently with water for 15-20 minutes. Remove contact lenses, if present, after the first five minutes, then continue rinsing eyes. Call a Poison Control Center or doctor for treatment advice. Hotline Number: Have the product container or label with you when calling a Poison Control Center or doctor, or going for treatment. You may also contact 1-800-257-3379 for emergency medical treatment information. To protect the environment, do not allow pesticide to enter or run off into storm drains, drainage ditches, gutters or surface waters. Applying this product in calm weather when rain is not predicted for the next 24 hours will help to ensure that wind or rain does not blow or wash pesticide off the treatment area.